A meaningful pendant necklace imbued with a message that goes the distance. Kathy Bransfield credits quotations for uplifting her through many of life's most challenging moments, so it's a small wonder that the California-based artist makes them a focal point of her work. 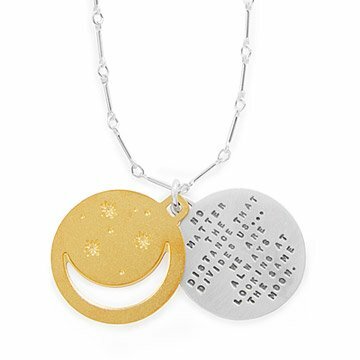 This pendant necklace is etched with words meant to remind us that dear ones are ever with us in spirit: "No matter the distance that divides us...we are always looking at the same moon." A 22-karat gold-plated overlay of stars and a crescent moon rests atop the sterling silver pendant, which hangs from a sterling silver chain. Handmade in California. I wear this necklace a lot because of the meaning and because my son purchased it for me. It seems to be holding up okay. I thought the product was expensive for what it was. Very sad that the words were hard to read. Wonderful Gift for my daughter-She adores it..
We really miss being close. This gift for her birthday was perfect, she adores it. The chain was not impressive. Add a few dollars to the overall cost and improve the chain. Not happy with overall quality of product - I hope the chain holds up, it is very lightweight. Beautiful craftsmanship. I can always rely on uncommongoods for unique and special gift ideas. I would buy this pendant again. The pendant is unique - very special - well made with care.